The stock market shrugged off both political and economic concerns last week to close with solid gains for the fourth week in a row. The beaten-down financial sector led the market higher providing clear evidence that my earnings concerns over the sector last week were clearly misplaced. The bank earnings were mixed, but even those stocks who missed on earnings, like Morgan Stanley (MS), still had a good week, with MS closing up 4.7%. The SPDR S&P Regional Bank ETF (KBE) was a standout, up 6.7% for the week, closing at $42.66. This ETF has strong resistance now in the $45 area while it had a high in August of $49.04 . The poor-performing Dow Transportation Average also had a good week, up 4.02%, and is up 9.2% for the month. It closed at 10,012, up 386 points this week, but is still below the all-time high from August at 11,623. All of the other averages, except the Dow Jones Utilities, are already showing solid YTD gains. The 9.9% YTD performance by the Russell 2000 Small-Cap would be a decent return for the whole year. The Vanguard Small-Cap Growth (VBK) is up over 10% YTD. The markets may react to this news when they reopen Tuesday, but that will not change the dramatic technical improvement. The Spyder Trust (SPY) was able to overcome the 50% resistance level at $262.64, which makes the 61.8% resistance at $269.45 the next upside target. As I noted last week, the weekly S&P 500 Advance/Decline line had moved above its WMA. The A/D numbers were strong last week and the A/D line has broken its downtrend (line b). This is a positive sign for the intermediate term trend, as it indicates that SPY can now make a new all-time high. This may sound outrageous as the S&P 500 is still 8.9% below its all-time high. The last similar signal occurred in early May 2018 when the S&P 500 was still 5.3% below its January 26th high. By August, the S&P 500 was making new highs that were confirmed by new highs in the A/D line. During the 4th quarter decline, I noted that the A/D line was behaving stronger than prices. The SPY had dropped below the early 2018 lows in December, but the A/D line held above the January highs (line c). This was an encouraging sign amid what seemed like a collapsing market. The positive action in SPY was supported by the Invesco QQQ Trust (QQQ), which closed one cent below the 50% resistance at $165.26. It did close the week well above the QPivot at $161.32. The 61.8% resistance is at $170.39, with quarterly pivot resistance at $179.18. The rising 20-day EMA is at $159.72 with the monthly pivot at $157.01. The Nasdaq 100 A/D line has broken the downtrend (line a) from the September highs. The A/D line turned sharply higher late in the week, as it is now showing a steep and bullish rate of change. The WMA is also now rising sharply. The NYSE Composite was up 2.6% last week, as it closed above the 50% retracement resistance at 11,992. This leaves the 61.8% resistance at 12,291 which is just 1.1% above Friday’s close. The downtrend from the October and November highs is at 12,541. The NYSE All A/D line peaked on August 29, and when the NYSE Composite made a new high on September 21, the A/D line formed a lower high. This bearish divergence (line a) has been the key level of resistance since early October. The sharp rally last week makes it likely that this resistance will soon be overcome. The weekly Russell 2000 A/D line, which tracks the iShares Russell 2000 (IWM), has just moved above its WMA. It is not as strong as the Dow Industrials A/D line, which is now close to making a new high. Does the performance so far in 2019 mean it is now a worry-free market? Have the many investor concerns from late 2018 been resolved? Does this mean you can buy with abandon? The prospect of multiple rate hikes depressed stocks in the 4th quarter of 2018, as Fed Chair Powell’s comments frightened an already-nervous market. His recent comments have reassured investors, but that does not mean that the Fed will not raise rates in 2019. The fear of a recession in 2019 and the prospect of weak earnings going forward have dissipated, but have not disappeared. Global economic weakness, especially in China, are already being addressed by the Chinese government, but success is not guaranteed. And of course, there is the political dysfunction in Washington DC and the current government shutdown, neither of which have dampened investor appetite for stocks (so far). This is despite the fact that last week, the White House doubled its estimate of the shutdown's impact on the GDP. The economic data last week was mixed. The Empire State Manufacturing Survey came in at 3.9 below the consensus estimate of 12, but the Philadelphia Fed Business Outlook Survey was at 17, up from a two-year low of 9.1 last month. 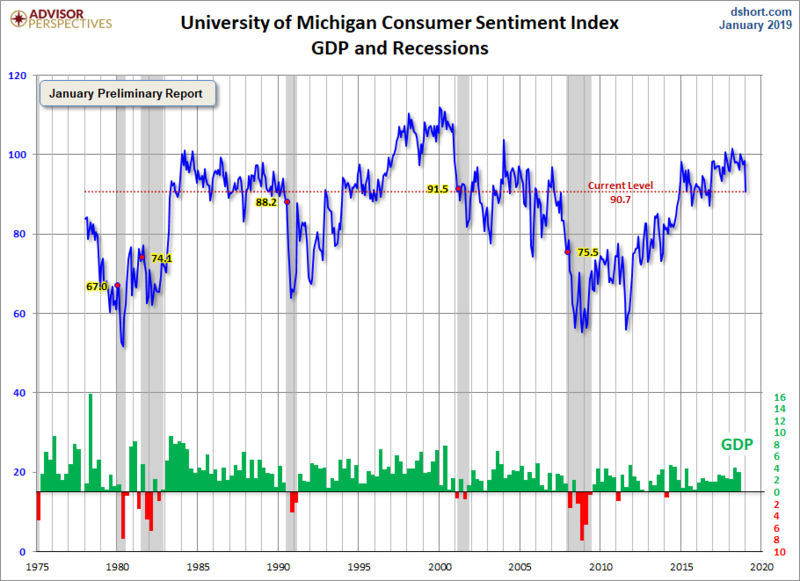 More concerning in my view was the drop in the preliminary reading on Consumer Sentiment which came in at 90.7, down from 97.0 from last month. A look at the long term chart from Advisor Perspective indicates that a drop below the September 2015 low at 87.2 would break the positive trend. This week, the government shutdown continues to delay much of the economic data coming out of the federal government, as happened to Retail Sales last week. However, Conference Board's Leading Indicators data comes out this week, so I'll be looking at those numbers for next week's article. The reassuring comments from Fed Chair Powell have kept the focus off of the bond market, but the yield on the 10-Year T-Note rose last week to 2.784%. The long term chart shows the top in yields that was completed last fall when support was broken. It looks quite similar to the formation that developed in 2013-2014. Yields had dropped down to support from the 2016-2017 highs (line a) in the $2.619% area before they bounced. If this is just a rebound in the downtrend then it should fail in the 2.85-2.890% area. The weekly MACD analysis diverged in 2018 (line c) and shows no signs yet of bottoming. There has been recent pressure on the interest-bearing ETF's like the utilities and REIT's. I had been expecting a pullback before the A/D indicators signaled a positive intermediate term trend, but that changed last week. As was the case in March 2016, the bullish A/D line analysis now favors an eventual move to the all time highs. But as always, I urge those entering the market to evaluate the risk on any new long positions before you buy. I do expect some profit-taking over the next week or so, but there were some ETF's that just bottomed out last week. I have found many more stocks that have just completed bottom formations, but I am still cautious about holding long positions in companies through their earnings reports. For those who were not in the market, I recommended a four-week dollar-cost averaging plan just before Christmas. Those that took my advice completed their last dollar cost average purchase on Monday, January 14. The other three purchases were made on 12/24, 12/31, and 1/7. The average closing price of the S&P 500 on these four days was 2497. As long as the S&P continues to close above 2348, I recommend holding this position. For those who are waiting to buy, I would use tools like the starc band analysis, so you can avoid buying stocks or ETFs when they are in a high-risk buy area. These bands are now available for free on Yahoo Finance’s charting platform. In my Viper ETF Report and the Viper Hot Stocks Report, I provide my A/D line analysis twice each week with specific buy and sell advice. 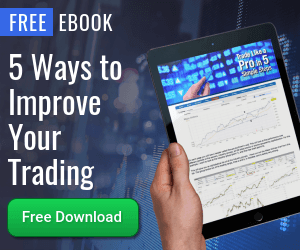 New subscribers receive six trading lessons for just $34.95 each per month.